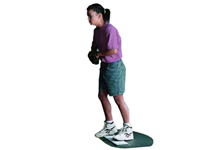 Portable pitching mounds are widely used by players from Little League, Colleges, and even Pro Players for off-season training, due to their overall low maintenance & portability. Developing & maintaining a dirt mound year after year can become very costly, not to mention inaccurate, resulting in improper training & a potential safety hazard. 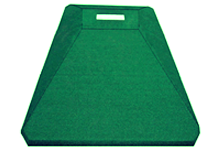 A portable mound can easily pay for itself after only a few seasons of use, and can even be used as a "multi-tasker mound" for multiple fields if needed. What are the most important factors to consider when shopping for a mound? 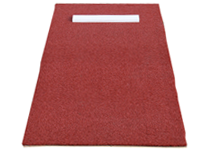 Include 90 degree angled edges - designed for straight-ahead pitching practice only - cheaper than "game mounds". Include tapered edges, to allow the mound's edges to fit flush with the ground. 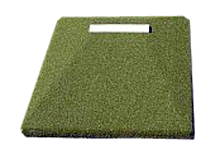 This creates a safer environment during games, allowing for pick-off moves and accommodating players running across the field to catch pop-flys. Game mounds are always more expensive than "practice mounds" due to their advanced design. Typically include rubber height of 6" or less - a fairly common youth regulation. Include rubber height of 10" - a high-school, collegiate, & pro regulation. The rubber height is measured from a level ground surface to the top of the rubber. Pay attention to the length & width when shopping for a mound. Longer mounds are more suitable for taller players with longer strides - don't end up with a mound your player will outgrow & won't allow them to simulate a game condition. The width is important to allow players to practice the wind-up from all sides of the rubber. Pack dirt around edges of mound to help conform to the ground & create a more flush playing area. The bigger the mound, the heavier it becomes. This can be a Pro & Con. On one hand it becomes more cumbersome to move around - on the other hand it stays in place much better than a smaller mound without reinforcement. 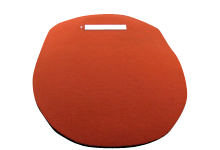 2-piece mounds can be useful, allowing for easier storage and better portability. 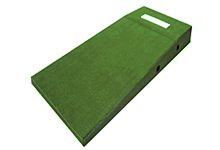 xGame mounds have tapered edges to conform to a field, which are safer for game play. 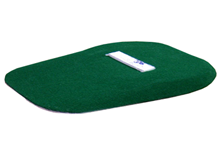 Practice mounds have straight edges & are designed only for straight-ahead pitching practice. xYou don't want a player to stride off the end of the mound which would cause an uneven landing. Taller players need longer mounds. xThey are by nature, but some are easier to port around than others. The 2-piece "portolite" are the easiest, but all can be moved with the help of a few people & a truck. 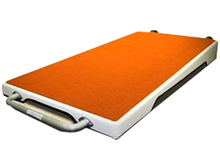 xMost are made from a high-density foam, but others are made from fiberglass. xNot under normal usage. It's a HD stryo-foam designed for impact. However, a fiberglass mound will outlast a foam mound simply by virtue of it being a harder material. xIt depends on your preference. Foam mounds are lighter & easier to transport, but fiberglass are more durable and will stay in place better. xTurf patching is fairly easy in a small area. Complete resurfacing is relatively easy by experienced personnel and requires a limited amount of adhesive. xThe length and weight are considered "extreme" by the truck-lines, resulting in higher transit costs. xAll mounds ship direct from their respective manufacturers throughout the country. 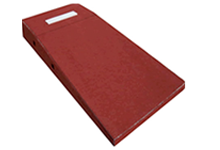 xAll mounds carry their respective manufacturer's warranty, which begins upon delivery.